I saw this book on Algonquin's list and I had to take a peek. How to Get Your Child to Love Reading : For Ravenous and Reluctant Readers Alike is not a new release. It's on Algonquin's back-list. I had a feeling though that this might be one of those great How-To resources that were worth looking into. 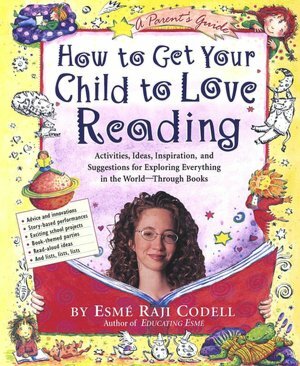 How to Get Your Child to Love Reading is a cousin to Read for the Heart (linked to my thoughts) or Honey for a Child's Heart. I would say the difference is in the author. Esme Raji Codell is a former schoolteacher and school librarian who is clearly passionate about children's literature. Her enthusiasm for it jumps off of the first few pages as she makes the argument that some children say that they do not like reading simply because they haven't been matched with the right book or author. Codell isn't so much a proponent of one-size-fits-all but certain-books-for-certain-children to develop a love of reading, learning and maturing. 2. Tips for reading aloud. 3. Encouragement to know the child you are reading to or with. 4. Ideas for incorporating art into the reading experience. 5. Websites to further your own knowledge about certain books. 7. Activity and event ideas surrounding BOOKS! I liked flipping through this particular book as it inspired me to find new ways to enjoy good books with my children. Codell has an excited sounding writing voice which motivates me onward. You know that if you say something in an exciting tone, you can almost make anyone believe everything you say. Of course, it helps if your audience is already pre-disposed to agree with your argument. Thanks, Algonquin, for allowing me the opportunity to browse this book! This sounds like a beneficial read! I like that she sounds so excited for her cause. I wish I'd had that when my guys were young. They all loved reading when they were little, but only one stayed an avid reader. Another is getting back into it some as an adult, and I have hopes the youngest will as well. He does enjoy reading when he has to (his English teacher requires a certain number of book reports a year. Yay!) But he doesn't pick up a book unless he has to at this point, which makes me sad. I also subscribe to the theory that they will love reading if they are constantly tripping over books. It's worth the occasional library fine. But mine are young...and I pray that my son will especially will keep loving books. LOL! Now I can use my messy book house as a working theory to make my kids love books! We have been so wrapped up in getting everything done in school that we have neglected our regular reading. I think I would enjoy flipping through this book as well. He, he, I'm thinking that must be a very short book. OK, now I'm going to actually read your review! @QOC & Sky - ;D It's impossible to keep books on the shelves. The kids just drag them out again and I only feel motivation to re-shelve every once in awhile. That's why I switched to baskets. Somehow it's easier to put a book in a basket than to put it on a shelf. We also have books everywhere. My oldest (8 yrs) is an avid reader. More accurately he DEVOURS books. I know it's time to visit the library when he starts wandering through the house in search of new reading material. Last week he set a goal for himself to read all of our Ramona books, again. He did it in 3 days. My #2 boy (7 yrs) is a different kind of reader. At the beginning of this school year I panicked that he wasn't going to love reading. Then I relaxed as I realized he's a non-fiction guy. He'll sit with Dad and read page after page of an animal encyclopedia but let Dad pick up Hardy Boys or some other adventure fiction to read aloud and he's off to other parts of the house. All that to say, I agree with the author that books and children are not one size fits all. I love talking about books and listening to people talk about books! Now I have to write a longer post about loving books on my blog. I really loved this book, mostly as a resource. I used the birthday lists for about a year when my son was younger, we had author themed birthday parties monthly which was really fun. Shonya is right. If the parents love reading, the kids will naturally pick up on that. Totally love the idea of having tons of books lying around. We try to keep them shelved, but the whole reason I shop at Goodwill is so that the books will be here in our home (and we haven't broken the bank to buy them). This book looks fantastic, thanks for sharing your review! I read another book by this author many years ago that was about teaching. Her name always makes me smile because my nickname in college was "Codell" since it was my first initial and my last name.